"Red October" redirects here. For other uses, see Red October (disambiguation) and October Revolution (disambiguation). The October Revolution,[a] officially known in Soviet historiography as the Great October Socialist Revolution[b] and commonly referred to as the October Uprising, the October Coup, the Bolshevik Revolution, the Bolshevik Coup or the Red October, was a revolution in Russia led by the Bolshevik Party of Vladimir Lenin that was instrumental in the larger Russian Revolution of 1917. It took place with an armed insurrection in Petrograd on 7 November (25 October, O.S.) 1917. The Bolshevik Party and the left fraction of Socialist Revolutionary Party - a fraction calling to stop the war and land to the peasants with overwhelming support from the countryside - actually had a majority in the Russian population. At first, the event was referred to as the October coup (Октябрьский переворот) or the Uprising of 3rd, as seen in contemporary documents (for example, in the first editions of Lenin's complete works). In Russian, however, "переворот" has a similar meaning to "revolution" and also means "upheaval" or "overturn", so "coup" is not necessarily the correct translation. With time, the term October Revolution (Октябрьская революция) came into use. It is also known as the "November Revolution" having occurred in November according to the Gregorian Calendar (for details, see Soviet calendar). The February Revolution had toppled Tsar Nicholas II of Russia, and replaced his government with the Russian Provisional Government. However, the provisional government was weak and riven by internal dissension. It continued to wage World War I, which became increasingly unpopular. A nationwide crisis developed in Russia, affecting social, economic, and political relations. Disorder in industry and transport had intensified, and difficulties in obtaining provisions had increased. Gross industrial production in 1917 had decreased by over 36% from what it had been in 1914. In the autumn, as much as 50% of all enterprises were closed down in the Urals, the Donbas, and other industrial centers, leading to mass unemployment. At the same time, the cost of living increased sharply. Real wages fell about 50% from what they had been in 1913. Russia's national debt in October 1917 had risen to 50 billion rubles. Of this, debts to foreign governments constituted more than 11 billion rubles. The country faced the threat of financial bankruptcy. Throughout June, July, and August 1917, it was common to hear working-class Russians speak about their lack of confidence and misgivings with those in power in the Provisional Government. Factory workers around Russia felt unhappy with the growing shortages of food, supplies, and other materials. They blamed their own managers or foremen and would even attack them in the factories. The workers blamed many rich and influential individuals, such as elites in positions of power, for the overall shortage of food and poor living conditions. Workers labelled these rich and powerful individuals as opponents of the Revolution, and called them words such as "bourgeois, capitalist, and imperialist." In September and October 1917, there were mass strike actions by the Moscow and Petrograd workers, miners in Donbas, metalworkers in the Urals, oil workers in Baku, textile workers in the Central Industrial Region, and railroad workers on 44 railway lines. In these months alone, more than a million workers took part in strikes. Workers established control over production and distribution in many factories and plants in a social revolution. Workers were able to organize these strikes through factory committees. The factory committees represented the workers and were able to negotiate better working conditions, pay, and hours. Even though workplace conditions may have been increasing in quality, the overall quality of life for workers was not improving. There were still shortages of food and the increased wages workers had obtained did little to provide for their families. By October 1917, peasant uprisings were common. By autumn the peasant movement against the landowners had spread to 482 of 624 counties or 77% of the country. As 1917 progressed the peasantry increasingly began to lose faith that the land would be distributed to them by the Social Revolutionaries and the Mensheviks. Refusing to continue living as before they increasingly took measures into their own hands as can be seen by the increase in the number and militancy of the peasant's actions. From the beginning of September to the October Revolution there were over a third as many peasant actions than had been recorded since March. Over 42% of all the cases of destruction (usually burning down and seizing property from the landlord's estate) recorded between February and October occurred in October . While the uprisings varied in severity, complete uprisings and seizures of the land were not uncommon. Less robust forms of protest included marches on landowner manors and government offices, as well as withholding and storing grains rather than selling them as a result of the economic crisis. When the Provisional Government sent punitive detachments, it only enraged the peasants. The garrisons in Petrograd, Moscow, and other cities, the Northern and Western fronts, and the sailors of the Baltic Fleet in September declared through their elected representative body Tsentrobalt that they did not recognize the authority of the Provisional Government and would not carry out any of its commands. Soldiers' wives were key players in unrest in the village. From 1914 to 1917, almost 50% of healthy men were sent to war, and many were killed on the front, resulting in a female occupation of the position of the household head. When government allowances were often late and were not sufficient to match the rising costs of goods, soldiers' wives sent masses of appeals and letters to the government, which largely were left unanswered. Frustration resulted, and these women were influential in inciting "subsistence riots" – also referred to as "hunger riots," "pogroms," or "baba riots". In these riots, citizens seized food and resources from shop owners who they believed to be charging unfair prices. Upon police intervention, protesters responded with "rakes, sticks, rocks and fists". In a diplomatic note of 1 May, the minister of foreign affairs, Pavel Milyukov, expressed the Provisional Government's desire to continue the war against the Central Powers "to a victorious conclusion", arousing broad indignation. On 1–4 May, about 100,000 workers and soldiers of Petrograd, and after them the workers and soldiers of other cities, led by the Bolsheviks, demonstrated under banners reading "Down with the war!" and "all power to the soviets!" The mass demonstrations resulted in a crisis for the Provisional Government. 1 July saw more demonstrations, as about 500,000 workers and soldiers in Petrograd demonstrated, again demanding "all power to the soviets", "down with the war", and "down with the ten capitalist ministers". The Provisional Government opened an offensive against the Central Powers on 1 July, which soon collapsed. The news of the offensive and its collapse intensified the struggle of the workers and the soldiers. A new crisis in the Provisional Government began on 15 July. On 16 July, spontaneous demonstrations of workers and soldiers began in Petrograd, demanding that power be turned over to the soviets. The Central Committee of the Russian Social Democratic Labour Party provided leadership to the spontaneous movements. On 17 July, over 500,000 people participated in what was intended to be a peaceful demonstration in Petrograd, the so-called July Days. The Provisional Government, with the support of Socialist-Revolutionary Party-Menshevik leaders of the All-Russian Executive Committee of the Soviets, ordered an armed attack against the demonstrators, killing hundreds. A period of repression followed. On 5–6 July, attacks were made on the editorial offices and printing presses of Pravda and on the Palace of Kshesinskaya, where the Central Committee and the Petrograd Committee of the Bolsheviks were located. On 7 July, the government ordered the arrest and trial of Vladimir Lenin. He was forced to go underground, as he had been under the Tsarist regime. Bolsheviks were arrested, workers were disarmed, and revolutionary military units in Petrograd were disbanded or sent to the war front. On 12 July, the Provisional Government published a law introducing the death penalty at the front. The second coalition government was formed on 24 July, chaired by Alexander Kerensky. Another problem for the government centered on General Lavr Kornilov, who had been Commander-in-Chief since 18 July. In response to a Bolshevik appeal, Moscow's working class began a protest strike of 400,000 workers. They were supported by strikes and protest rallies by workers in Kiev, Kharkov, Nizhny Novgorod, Ekaterinburg, and other cities. In what became known as the Kornilov affair, Kornilov directed an army under Aleksandr Krymov to march toward Petrograd to restore order to Russia, with Kerensky's agreement. Details remain sketchy, but Kerensky appeared to become frightened by the possibility the army would stage a coup, and reversed the order. By contrast, historian Richard Pipes has argued that the episode was engineered by Kerensky. On 27 August, feeling betrayed by the government, Kornilov pushed on towards Petrograd. With few troops to spare on the front, Kerensky turned to the Petrograd Soviet for help. Bolsheviks, Mensheviks and Socialist Revolutionaries confronted the army and convinced them to stand down. The Bolsheviks' influence over railroad and telegraph workers also proved vital in stopping the movement of troops. Right-wingers felt betrayed, and the left wing was resurgent. With Kornilov defeated, the Bolsheviks' popularity in the soviets grew significantly, both in the central and local areas. On 31 August, the Petrograd Soviet of Workers and Soldiers Deputies, and on 5 September, the Moscow Soviet Workers Deputies adopted the Bolshevik resolutions on the question of power. The Bolsheviks won a majority in the Soviets of Briansk, Samara, Saratov, Tsaritsyn, Minsk, Kiev, Tashkent, and other cities. Vladimir Lenin, who had been living in exile in Switzerland, organised a plan with other dissidents to negotiate a passage for them through Germany, with whom Russia was then at war. Recognising that these dissidents could cause problems for their Russian enemies, the German government agreed to permit 32 Russian citizens to travel in a "sealed" train carriage through their territory, among them Lenin and his wife. According to the Deutsche Welle, "On November 7, 1917, a coup d'état went down in history as the October Revolution. The interim government was toppled, the Soviets seized power, and Russia later terminated the Triple Entente military alliance with France and Britain. For Russia, it was effectively the end of the war. Kaiser Wilhelm II had spent around half a billion euros ($582 million) in today's money to weaken his wartime enemy." On 23 October 1917 (5 November New Style), the Bolsheviks' Central Committee voted 10–2 for a resolution saying that "an armed uprising is inevitable, and that the time for it is fully ripe". At the Committee meeting, Lenin discussed how the people of Russia had waited long enough for "an armed uprising", and it was the Bolsheviks' time to take power. Lenin expressed his confidence in the success of the planned insurrection. His confidence stemmed from months of Bolshevik buildup of power and successful elections to different committees and councils in major cities such as Petrograd and Moscow. The Bolsheviks created a revolutionary military committee within the Petrograd soviet, led by the soviet's president, Trotsky. The committee included armed workers, sailors and soldiers, and assured the support or neutrality of the capital's garrison. The committee methodically planned to occupy strategic locations through the city, almost without concealing their preparations: the Provisional Government's president Kerensky was himself aware of them, and some details, leaked by Kamenev and Zinoviev, were published in newspapers. In the early morning of 24 October (6 November N.S. ), a group of soldiers loyal to Kerensky's government marched on the printing house of the Bolshevik newspaper, Rabochy put (Worker's Path), seizing and destroying printing equipment and thousands of newspapers copies. Shortly thereafter the government announced the immediate closure of not only Rabochy put but also the left-wing Soldat as well as the far-right newspapers Zhivoe slovo and Novaia Rus'. The editors of these newspapers, as well as any authors seen to be calling for insurrection, were to be prosecuted on criminal charges. In response, at 9 AM the Military Revolutionary Committee issued a statement denouncing the government's actions. At 10 AM, Bolshevik-aligned soldiers successfully retook the Rabochy put printing house. Kerensky responded at approximately 3 PM that afternoon by ordering the raising of all but one of Petrograd's bridges, a tactic used by the government several months earlier in the July Days. What followed was a series of sporadic clashes over control of the bridges between Red Guard militias aligned with the Military Revolutionary Committee and military regiments still loyal to the government. At approximately 5 PM the Military Revolutionary Committee seized the Central Telegraph of Petrograd, giving the Bolsheviks control over communications through the city. On 25 October (7 November new style) 1917, Bolsheviks led their forces in the uprising in Petrograd (now St. Petersburg, then capital of Russia) against the Kerensky Provisional Government. 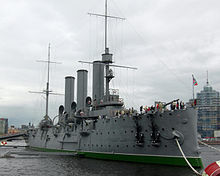 The event coincided with the arrival of a flotilla of pro-Bolshevik marines, primarily five destroyers and their crews, in St. Petersburg harbor. At Kronstadt, sailors also announced their allegiance to the Bolshevik insurrection. In the early morning, the military-revolutionary committee planned the last of the locations to be assaulted or seized from its heavily guarded and picketed center in Smolny Palace. The Red Guards systematically captured major government facilities, key communication installations and vantage points with little opposition. The Petrograd Garrison and most of the city's military units joined the insurrection against the Provisional Government. Kerensky and the Provisional Government were virtually helpless to offer significant resistance. Railways and railway stations had been controlled by Soviet workers and soldiers for days, making rail travel to and from Petrograd impossible for Provisional Government officials. The Provisional Government was also unable to locate any serviceable vehicles. On the morning of the insurrection, Kerensky desperately searched for a means of reaching military forces he hoped would be friendly to the Provisional Government outside the city, and ultimately borrowed a Renault car from the American embassy, which he drove from the Winter Palace alongside a Pierce Arrow. Kerensky was able to evade the pickets going up around the palace and drive to meet approaching soldiers. As Kerensky left Petrograd, Lenin wrote a proclamation "To the Citizens of Russia" stating that the Provisional Government had been overthrown by the Military Revolutionary Committee. The proclamation was sent by telegraph throughout Russia even as the pro-Soviet soldiers were seizing important control centers throughout the city. One of Lenin's intentions was to present members of the Soviet congress, who would assemble that afternoon, with a fait accompli and thus forestall further debate on the wisdom or legitimacy of taking power. A bloodless insurrection occurred with a final assault against the Winter Palace, with 3,000 cadets, officers, cossacks and female soldiers poorly defending the Winter Palace. The Bolsheviks delayed the assault because the revolutionaries could not find functioning artillery. The Bolsheviks also prolonged the assault for fear of violence since the insurrection did not generate violent outbreaks. At 6:15 p.m., a large group of artillery cadets abandoned the palace, taking their artillery with them. At 8:00 p.m., 200 cossacks left the palace and returned to their barracks. While the cabinet of the provisional government within the palace debated what action to take, the Bolsheviks issued an ultimatum to surrender. Workers and soldiers occupied the last of the telegraph stations, cutting off the cabinet's communications with loyal military forces outside the city. As the night progressed, crowds of insurgents surrounded the palace, and many infiltrated it. While Soviet historians and officials tended to depict the event in heroic terms, the insurrection and even the seizure of the Winter Palace happened almost without resistance. At 9:45 p.m, the cruiser Aurora fired a blank shot from the harbor. Some of the revolutionaries entered the Palace at 10:25 p.m. and there was a mass entry 3 hours later. By 2:10 a.m on 26 October Bolshevik forces had gained control of the palace. After sporadic gunfire throughout the building, the cabinet of the provisional government had surrendered. The only member who was not arrested was Kerensky himself who had already left the Palace. Later official accounts of the revolution from the Soviet Union would depict the events in October as being far more dramatic than they actually had been. (See a first-hand account by British General Knox.) This was aided by the historical reenactment, entitled The Storming of the Winter Palace, which was staged in 1920. This reenactment, watched by 100,000 spectators, provided the model for official films made much later, which showed a huge storming of the Winter Palace and fierce fighting. In reality, the Bolshevik insurgents faced little opposition. The insurrection was timed and organized to hand state power to the Second All-Russian Congress of Soviets of Workers' and Soldiers' Deputies, which began on 25 October (7 November new style). After a single day of revolution, the death toll was low not because Bolsheviks decided not to use artillery fire, but instead because the class struggle was used as the strongest weapon. Soviet government archives show that parties of Bolshevik operatives sent from the Smolny Institute by Lenin took over all critical central power in Petrograd in the early hours of the first night without a significant number of shots fired. This was completed so efficiently that the takeover resembled the changing of the guard. There was not much of a storming of the Winter Palace because the resistance basically did not exist and at 2:10 a.m. on 26 October (8 November new style) 1917 the Red Guards took control of the Winter Palace. The Cossacks deserted when the Red Guard approached, and the Cadets and the 140 volunteers of the Women's Battalion surrendered rather than resist the 40,000 strong army. The Aurora was commandeered to then fire blanks at the palace in a symbolic act of rejection of the government. The Bolsheviks effectively controlled the almost unoccupied Winter Palace not because of an intense military barrage, but because the back door was left open, allowing the Red Guard to enter. The Provisional Government was arrested and imprisoned in Peter and Paul Fortress after the ministers resigned to fate and surrendered without a fight, and officially overthrown. Later stories of the heroic "Storming of the Winter Palace" and "defense of the Winter Palace" were later propaganda by Bolshevik publicists. Grandiose paintings depicting the "Women's Battalion" and photo stills taken from Sergei Eisenstein's staged film depicting the "politically correct" version of the October events in Petrograd came to be taken as truth. With the Petrograd Soviet now in control of government, garrison and proletariat, the Second All Russian Congress of Soviets held its opening session on the day, while Trotsky dismissed the opposing Mensheviks and the Socialist Revolutionaries (SR) from Congress. Some sources contend that as the leader of Tsentrobalt, Pavlo Dybenko played an enormous role in the revolt. It is said[who?] that the ten warships that entered the city with ten thousand Baltic fleet mariners was the force that actually took the power in Petrograd and put down the Provisional Government. 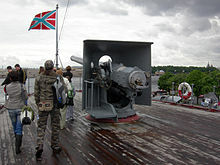 The same mariners then dispersed by force the elected parliament of Russia, and used machine-gun fire against protesting demonstrators in Petrograd. About 100 demonstrators were killed, and several hundreds wounded. Dybenko in his memoirs mentioned this event as "several shots in the air". These are disputed by various sources such as Louise Bryant, who claims that news outlets in the West at the time reported that the unfortunate loss of life occurred in Moscow, not Petrograd, and the number was much less than suggested above. As for the "several shots in the air", there is little evidence suggesting otherwise. The Second Congress of Soviets consisted of 670 elected delegates; 300 were Bolshevik and nearly a hundred were Left Socialist-Revolutionaries, who also supported the overthrow of the Alexander Kerensky Government. When the fall of the Winter Palace was announced, the Congress adopted a decree transferring power to the Soviets of Workers', Soldiers' and Peasants' Deputies, thus ratifying the Revolution. The transfer of power was not without disagreement. The center and Right wings of the Socialist Revolutionaries as well as the Mensheviks believed that Lenin and the Bolsheviks had illegally seized power and they walked out before the resolution was passed. As they exited, they were taunted by Leon Trotsky who told them "You are pitiful isolated individuals; you are bankrupts; your role is played out. Go where you belong from now on — into the dustbin of history!" The following day, 26 October, the Congress elected a new cabinet of Bolsheviks, pending the convocation of a Constituent Assembly. This basis for the new Soviet government was known as the Council (Soviet) of People's Commissars (Sovnarkom), with Lenin as leader. Lenin allegedly approved of the name, reporting that it "smells of revolution". The cabinet quickly passed the Decree on Peace and the Decree on Land. This new government was also officially called "provisional" until the Assembly was dissolved. Posters were pinned on walls and fences by the Right Socialist Revolutionaries, describing the takeover as a "crime against the motherland and revolution". On 27 October 1917 (9 November new style), the Mensheviks seized power in Georgia and declared it an independent republic. The Don Cossacks also claimed control of their own government. The biggest Bolshevik strongholds were in the cities, particularly Petrograd, with support much more mixed in rural areas. The peasant dominated Left SR Party was in coalition with the Bolsheviks. There are reports that the Provisional Government had not conceded defeat and are meeting with the army at the Front. 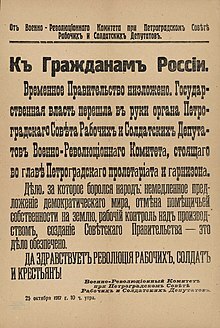 On 28 October 1917,(10 November new style) some posters and newspapers started criticizing the actions of the Bolsheviks and refuted their authority. The Executive Committee of Peasants Soviets "[refuted] with indignation all participation of the organised peasantry in this criminal violation of the will of the working class". On 29 October 1917, opposition to the Bolsheviks developed into major counter-revolutionary action. Cossacks entered Tsarskoye Selo on outskirts of Petrograd with Kerensky riding on a white horse welcomed by church bells. Kerensky gave an ultimatum to the rifle garrison to lay down weapons, which was promptly refused. They were then fired upon by Kerensky's Cossacks, which resulted in 8 deaths. This turned soldiers in Petrograd against Kerensky because he was just like the Tsarist regime. Kerensky's failure to assume authority over troops was described by John Reed as a 'fatal blunder' that signalled the final death of the government. On 30 October 1917 (12 November new style), the battle against the anti-Bolsheviks continued. The Red Guard fought against Cossacks at Tsarskoye Selo, with the Cossacks breaking rank and fleeing, leaving their artillery behind. On 31 October 1917 (13 November new style), the Bolsheviks gained control of Moscow after a week of bitter street-fighting. Artillery had been freely used with an estimated 700 casualties. However, there was still continued support for Kerensky in some of the provinces. On 1 November 1917 (14 November new style), there was an appeal to anti-Bolsheviks throughout Russia to join the new government of the people, with the Bolsheviks winning even more support from the Russian people. On 2 November 1917 (15 November new style), there was only minor public anti-Bolshevik sentiment; for example, the newspaper Novaya Zhizn criticised the lack of manpower and organisation of the Bolsheviks to run a party, let alone a government. Lenin confidently claimed that there is "not a shadow of hesitation in the masses of Petrograd, Moscow and the rest of Russia" towards Bolshevik rule. On 10 November 1917 (23 November new style), the government sought to label its citizens as "citizens of the Russian Republic," and make them equal in all possible respects. This was accomplished by the nullification of all "legal designations of civil equality, such as estates, titles, and ranks." The elections to the Constituent Assembly took place in November 1917. The Bolsheviks gained 23.9% of the vote. On 12 November (25 November new style), a Constituent Assembly was elected. In these elections, 26 mandatory delegates were proposed by the Bolshevik Central Committee and 58 were proposed by the Socialist Revolutionaries. The outcome of the election gave the majority to the Socialist Revolutionary Party, which no longer existed as a full party by that time, as the Left SR Party was in coalition with the Bolsheviks. The Bolsheviks dissolved the Constituent Assembly in January 1918, when it came into conflict with the Soviets. On 16 December 1917 (29 December 1917 new style), the government ventured to eliminate hierarchy in the army, removing all titles, ranks, and uniform decorations. The tradition of saluting was also eliminated. On 20 December 1917 (2 January 1918 new style), the Cheka was created by the decree of Vladimir Lenin. 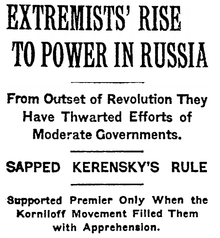 These were the beginnings of the Bolsheviks' consolidation of power over their political opponents. The Red Terror was started in September 1918, following a failed assassination attempt on Lenin's life. The Jacobin Terror was an example for the Soviet Bolsheviks. Leon Trotsky had compared Lenin to Maximilien Robespierre as early as 1904. All private property was nationalized by the government. All Russian banks were nationalized. Private bank accounts were expropriated. The properties of the Church (including bank accounts) were expropriated. All foreign debts were repudiated. Control of the factories was given to the soviets. Wages were fixed at higher rates than during the war, and a shorter, eight-hour working day was introduced. All private property were not nationalized by the government in the days, weeks and months that followed the revolution 25th of October 1917 according to the Julian calendar and 7th November in the Gregorian calendar. The government of the Bolshevik party and Left SR denied taking steps to support the working class population establishing their collective power of the main corporations and from there collectively organize the economy. As chairman of the government Lenin negotiated with fractions of the upper bourgeoisie. The aim was the bourgeoisie to manage the corporations according to orders and decisions from the new government. This failed utterly because it presupposed the masses to accept class cooperation in a revolutionary situation. It is in this context the Bolshevik party understood 'workers control' as checking and supervision by the employees to secure that orders from the government were followed. Instead some factories continued to be in private hands because the masses either had no local knowledge or they hesitated to act as supporters of the Bolshevik party. Other factories were taken over by the employees and some by the government after pressure from below or by initiative from the new government. This mess was rooted in lack of class consciousness of the masses who put their hands in an authoritarian political party. Only a minority of the working class population fought to establish a democratic rule of the main capitalist factories. The Bolshevik party opposed that the masses should rule the economy from below just as it also opposed that the political institutions to be ruled from below. That the government ultimately established state ownership in charge of the economy did not express any direct power from below. Through democratic elections in the soviets autumn 1917 did the Bolshevik party build its power to control of the trade unions which became state institutions. Later the same year the factory committees were subordinated to the trade unions. From this power base was it not so difficult to establish a one-man-rule of the factories. One administrative and one technical manager had the daily control but the technical manager had the last word related to the economy independent of what the employees wanted. The technical manager took orders from higher organs in the state. If the orders were not followed could other organs appeal to higher authorities or the government. The system of one-man-management was fiercely defended by Lenin on a trade union congress in spring 1918 where he said if the party is not in charge the whole point of a party ceased to exist and thereby the revolution itself. So much about Lenin's presumed democratic method. A system of appointment from above was established step by step. Local soviets resisting this policy were either met with armed Cheka troops and forced to submit or the soviets were denied access to ration cards for food and fuel to heat the living apartments and to make food. That the Bolshevik party blocked democratic elections to both the soviets, factory committees, the trade unions and other institutions made this transfer of power easier than expected. October revolution manifested a political revolution by taking down the old regime but failed to established a democratic council system from below. That the economy was not transferred into the masses reflected what happened in the political institutions. The very elite on the top of the political institutions understood itself as crucial for the world revolution but ended up as blocking all power from below. When the same elite also got power of the economy and the economic surplus answering only to itself is it correct to say the elite in reality transformed itself into a ruling state capitalist class. Later the Bolshevik party went further by claiming the working class had to be put under marshal law to obey the government - Sovnarkom. This development turned out to lead to a totalitarian state where Stalin just did what was exercised under Lenin and Trotsky but on a wider scale. Bolshevik-led attempts to gain power in other parts of the Russian Empire were largely successful in Russia proper — although the fighting in Moscow lasted for two weeks — but they were less successful in ethnically non-Russian parts of the Empire, which had been clamoring for independence since the February Revolution. For example, the Ukrainian Rada, which had declared autonomy on 23 June 1917, created the Ukrainian People's Republic on 20 November, which was supported by the Ukrainian Congress of Soviets. This led to an armed conflict with the Bolshevik government in Petrograd and, eventually, a Ukrainian declaration of independence from Russia on 25 January 1918. In Estonia, two rival governments emerged: the Estonian Provincial Assembly, established in April 1917, proclaimed itself the supreme legal authority of Estonia on 28 November 1917 and issued the Declaration of Independence on 24 February 1918. Soviet Russia recognized the Executive Committee of the Soviets of Estonia as the legal authority in the province, although the Soviets in Estonia controlled only the capital and a few other major towns. The success of the October Revolution transformed the Russian state into a soviet republic. A coalition of anti-Bolshevik groups attempted to unseat the new government in the Russian Civil War from 1918 to 1922. In an attempt to intervene in the civil war after the Bolsheviks' separate peace with the Central Powers, the Allied powers (United Kingdom, France, Italy, United States and Japan) occupied parts of the Soviet Union for over two years before finally withdrawing. The United States did not recognize the new Russian government until 1933. The European powers recognized the Soviet Union in the early 1920s and began to engage in business with it after the New Economic Policy (NEP) was implemented. Few events in historical research have been as conditioned by political influences as the October Revolution. The historiography of the Revolution generally divides into three camps: the Soviet-Marxist view, the Western-Totalitarian view, and the Revisionist view. Soviet historiography of the October Revolution is intertwined with Soviet historical development. Many of the initial Soviet interpreters of the Revolution were themselves Bolshevik revolutionaries. After the initial wave of revolutionary narratives, Soviet historians worked within "narrow guidelines" defined by the Soviet government. The rigidity of interpretive possibilities reached its height under Joseph Stalin. Soviet historians of the October Revolution interpreted the Revolution with regard to establishing the legitimacy of Marxist ideology, and also the Bolshevik government. To establish the accuracy of Marxist ideology, Soviet historians generally described the Revolution as the product of class struggle. They maintained that the Revolution was the supreme event in a world history governed by historical laws. The Bolshevik Party is placed at the center of the Revolution, exposing the errors of both the moderate Provisional Government and the spurious "socialist" Mensheviks in the Petrograd Soviet. Guided by Vladimir Lenin's leadership and his firm grasp of scientific Marxist theory, the Party led the "logically predetermined" events of the October Revolution from beginning to end. The events were, according to these historians, logically predetermined because of the socio-economic development of Russia, where the monopoly industrial capitalism alienated the masses. In this view, the Bolshevik party took the leading role in organizing these alienated industrial workers, and thereby established the construction of the first socialist state. Following the turn of the 21st century, some Soviet historians began to implement an "anthropological turn" in their historiographical analysis of the Russian Revolution. This method of analysis focuses on the average person's experience of day-to-day life during the revolution, and pulls the analytical focus away from larger events, notable revolutionaries, and overarching claims about party views. In 2006, S. V. Iarov employed this methodology when he focused on citizen adjustment to the new Soviet system. Iarov explored the dwindling labor protests, evolving forms of debate, and varying forms of politicization as a result of the new Soviet rule from 1917 to 1920. In 2010, O. S. Nagornaia took interest in the personal experiences of Russian prisoners of war taken by Germany, examining Russian soldiers and officers' ability to cooperate and implement varying degrees of autocracy despite being divided by class, political views and race. Other analyses following this "anthropological turn" have explored texts from soldiers and how they used personal war experiences to further their political goals, as well as how individual life-structure and psychology may have shaped major decisions in the civil war that followed the revolution. During the late Soviet period, the opening of select Soviet archives during glasnost sparked innovative research that broke away from some aspects of Marxism–Leninism, though the key features of the orthodox Soviet view remained intact. During the Cold War, Western historiography of the October Revolution developed in direct response to the assertions of the Soviet view. The Soviet version of the October Revolution conditioned historical interpretations in the United States and the West. As a result, these Western historians exposed what they believed were flaws in the Soviet view, thereby undermining the Bolsheviks' original legitimacy, as well as the precepts of Marxism. These Western historians described the revolution as the result of a chain of contingent accidents. Examples of these accidental and contingent factors they say precipitated the Revolution included World War I's timing, chance, and the poor leadership of Tsar Nicholas II as well as liberal and moderate socialists. According to Western historians, it was not popular support, but rather manipulation of the masses, ruthlessness, and the superior structure of the Bolsheviks that enabled it to survive. For these historians, the Bolsheviks' defeat in the Constituent Assembly elections of November–December 1917 demonstrated popular opposition to the Bolsheviks' coup, as did the scale and breadth of the Civil War. Western historians saw the organization of the Bolshevik party as proto-totalitarian. Their interpretation of the October Revolution as a violent coup organized by a proto-totalitarian party reinforced to them the idea that totalitarianism was an inherent part of Soviet history. For them, Stalinist totalitarianism developed as a natural progression from Leninism and the Bolshevik party's tactics and organization. The dissolution of the USSR affected historical interpretations of the October Revolution. Since 1991, increasing access to large amounts of Soviet archival materials made it possible to re‑examine the October Revolution. Though both Western and Russian historians now have access to many of these archives, the effect of the dissolution of the USSR can be seen most clearly in the work of historians in the former USSR. While the disintegration essentially helped solidify the Western and Revisionist views, post-USSR Russian historians largely repudiated the former Soviet historical interpretation of the Revolution. As Stephen Kotkin argues, 1991 prompted "a return to political history and the apparent resurrection of totalitarianism, the interpretive view that, in different ways…revisionists sought to bury". The term "Red October" (Красный Октябрь, Krasnyy Oktyabr) has also been used to describe the events of the month. This name has in turn been lent to a steel factory made notable by the Battle of Stalingrad, a Moscow sweets factory that is well known in Russia, and a fictional Soviet submarine. Ten Days That Shook the World, a book written by American journalist John Reed and first published in 1919, gives a firsthand exposition of the events. Reed died in 1920, shortly after the book was finished. Dmitri Shostakovich wrote his Symphony No. 2 in B major, Op. 14 and subtitled To October, for the 10th anniversary of the October Revolution. The choral finale of the work, "To October", is set to a text by Alexander Bezymensky, which praises Lenin and the revolution. The Symphony No. 2 was first performed by the Leningrad Philharmonic Orchestra and the Academy Capella Choir under the direction of Nikolai Malko, on 5 November 1927. Sergei Eisenstein and Grigori Aleksandrov's film October: Ten Days That Shook the World, first released on 20 January 1928 in the USSR and on 2 November 1928 in New York City, describes and glorifies the revolution and was commissioned to commemorate the event. 7 November, the anniversary of the October Revolution, was the official national day of the Soviet Union from 1918 onward and still is a public holiday in Belarus and the breakaway territory of Transnistria. The October revolution of 1917 also marks the inception of the first communist government in Russia, and thus the first large-scale socialist state in world history. After this Russia became the Russian SFSR and later part of the USSR, which dissolved in late 1991. ^ Russian: Октя́брьская револю́ция, tr. Oktyabr'skaya revolyutsiya, IPA: [ɐkˈtʲabrʲskəjə rʲɪvɐˈlʲutsɨjə]. ^ Вели́кая Октя́брьская социалисти́ческая револю́ция, Velikaya Oktyabr'skaya sotsialističeskaya revolyutsiya. ^ History.com Staff. "Russian Revolution." History.com, A&E Television Networks, 2009, www.history.com/topics/russian-revolution. ^ Samaan, A.E. (2 February 2013). From a "Race of Masters" to a "Master Race": 1948 to 1848. A.E. Samaan. p. 346. ISBN 0615747884. Retrieved 9 February 2017. ^ Jennifer Llewellyn, John Rae and Steve Thompson (2014). "The Constituent Assembly". Alpha History. ^ Bunyan & Fisher 1934, p. 385. ^ a b Steinberg, Mark (2017). The Russian Revolution 1905-1917. New York: Oxford University Press. pp. 143–146. ISBN 978-0-19-922762-4. ^ Trotsky, Leon (1934). History of the Russian Revolution. London: The Camelot Press ltd. p. 859-864. ^ "Steinberg, Mark (2017). The Russian Revolution 1905-1921. New York: Oxford University Press. pp. 196–197. ISBN 978-0-19-922762-4." ^ Upton, Anthony F. (1980). The Finnish Revolution: 1917-1918. Minneapolis, Minnesota: University of Minnesota Press. p. 89. ISBN 9781452912394. ^ Steinberg, Mark D. (2017). The Russian Revolution 1905-1921. Oxford, United Kingdom: Oxford University Press. pp. 191, 193–194. ISBN 9780199227624. ^ Richard Pipes (1990). The Russian Revolution. Knopf Doubleday. p. 407. ^ Michael C. Hickey (2010). Competing Voices from the Russian Revolution: Fighting Words: Fighting Words. ABC-CLIO. p. 559. ^ Pipes, 1997. p. 51. "There is no evidence of a Kornilov plot, but there is plenty of evidence of Kerensky's duplicity." ^ "Central Committee Meeting—10 Oct 1917". ^ Steinberg, Mark (2001). Voices of the Revolution, 1917. Binghamton, New York: Yale University Press. p. 170. ISBN 0300090161. ^ "1917 – La Revolution Russe". Arte TV. 16 September 2007. Archived from the original on 1 February 2016. Retrieved 25 January 2016. ^ Bard College: Experimental Humanities and Eurasian Studies. "From Empire To Republic: October 24 – November 1, 1917". Retrieved 24 February 2018. ^ "1917 Free History". Yandex Publishing. Retrieved 8 November 2017. ^ Jonathan Schell, 2003. 'The Mass Minority in Action: France and Russia'. For example, in The Unconquerable World. London: Penguin, pp. 167–185. ^ "ВОЕННАЯ ЛИТЕРАТУРА --[ Мемуары ]-- Дыбенко П.Е. Из недр царского флота к Великому Октябрю". ^ Steinberg, Mark D. (2001). Voices of Revolution, 1917. Yale University. p. 251. ISBN 978-0300101690. ^ a b Steinberg, Mark D. (2001). Voices of Revolution. Yale University. p. 257. ^ Ward, John (2004). With the "Die-Hards" in Siberia. Dodo Press. p. 91. ISBN 1409906809. ^ Edward Acton, Critical Companion to the Russian Revolution, 1914–1921 (Bloomington: Indiana University Press, 1997), 5. ^ Stephen Kotkin, "1991 and the Russian Revolution: Sources, Conceptual Categories, Analytical Frameworks," The Journal of Modern History 70 (October 1998): 392. ^ a b c Acton, Critical Companion, 7. ^ Acton, Critical Companion, 8. ^ Alter Litvin, Writing History in Twentieth-Century Russia, (New York: Palgrave, 2001), 49–50. ^ Roger Markwick, Rewriting History in Soviet Russia: The Politics of Revisionist Historiography, (New York: Palgrave, 2001), 97. ^ Markwick, Rewriting History, 102. ^ Smith, S. A. (2015). "The historiography of the Russian Revolution 100 Years On". Kritika: Explorations in Russian and Eurasian History. 16: 733–749 – via Project MUSE. ^ Iarov, S.V. (2006). "Konformizm v Sovetskoi Rossii: Petrograd, 1917-20". Evropeiskii dom. ^ Nagornaia, O. S. (2010). "Drugoi voennyi opyt: Rossiiskie voennoplennye Pervoi mirovoi voiny v Germanii (1914-1922)". Novyi khronograf. ^ Morozova, O. M. (2010). "Dva akta dramy: Boevoe proshloe i poslevoennaia povsednevnost ' verteranov grazhdanskoi voiny". Rostov-on-Don: Iuzhnyi nauchnyi tsentr Rossiiskoi akademii nauk. ^ O. M., Morozova (2007). "Antropologiia grazhdanskoi voiny". Rostov-on-Don: Iuzhnyi nauchnyi tsentr RAN. ^ Acton, Critical Companion, 6–7. ^ Norbert Francis, "Revolution in Russia and China: 100 Years," International Journal of Russian Studies 6 (July 2017): 130-143. ^ Stephen E. Hanson (1997). Time and Revolution: Marxism and the Design of Soviet Institutions. U of North Carolina Press. p. 130. ^ Kotkin, "1991 and the Russian Revolution," 385-86. ^ Litvin, Writing History, 47. ^ Kotkin, "1991 and the Russian Revolution," 385. Ascher, Abraham (2014). The Russian Revolution: A Beginner's Guide. Oneworld Publications. Beckett, Ian F. W. (2007). The Great war (2 ed.). Longman. ISBN 1-4058-1252-4. Bone, Ann (trans.) (1974). The Bolsheviks and the October Revolution: Central Committee Minutes of the Russian Social-Democratic Labour Party (Bolsheviks) August 1917-February 1918. Pluto Press. ISBN 0-902818546. Bunyan, James; Fisher, Harold Henry (1934). The Bolshevik Revolution, 1917–1918: Documents and Materials. Palo Alto: Stanford University Press. OCLC 253483096. Chamberlin, William Henry (1935). The Russian Revolution. I: 1917–1918: From the Overthrow of the Tsar to the Assumption of Power by the Bolsheviks. Old Classic. Figes, Orlando (1996). A People's Tragedy: The Russian Revolution: 1891–1924. Pimlico. Guerman, Mikhail (1979). Art of the October Revolution. Kollontai, Alexandra (1971). "The Years of Revolution". The Autobiography of a Sexually Emancipated Communist Woman. New York: Herder and Herder. OCLC 577690073. Krupskaya, Nadezhda (1930). "The October Days". Reminiscences of Lenin. Moscow: Foreign Languages Publishing House. OCLC 847091253. Luxemburg, Rosa (1940) . The Russian Revolution. Translated by Bertram Wolfe. New York City: Workers Age. OCLC 579589928. Radek, Karl (1995) [First published 1922 as "Wege der Russischen Revolution"]. "The Paths of the Russian Revolution". In Bukharin, Nikolai; Richardson, Al (eds.). In Defence of the Russian Revolution: A Selection of Bolshevik Writings, 1917–1923. London: Porcupine Press. pp. 35–75. ISBN 1899438017. OCLC 33294798. Serge, Victor (1972) . Year One of the Russian Revolution. London: Penguin Press. OCLC 15612072. Swain, Geoffrey (2014). Trotsky and the Russian Revolution. Routledge. Trotsky, Leon (1930). "XXVI: FROM JULY TO OCTOBER". My Life. London: Thornton Butterworth. OCLC 181719733. Trotsky, Leon (1932). The History of the Russian Revolution. III. Translated by Max Eastman. London: Gollancz. OCLC 605191028. 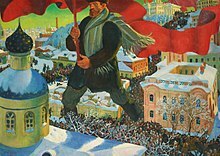 Wikimedia Commons has media related to Russian Revolution of 1917. Read, Christopher: Revolutions (Russian Empire), in: 1914-1918-online. International Encyclopedia of the First World War. Peeling, Siobhan: July Crisis 1917 (Russian Empire), in: 1914-1918-online. International Encyclopedia of the First World War. How the Bolshevik party elite crushed the democratic elected workers and popular councils - soviets - and established totalitarian state capitalism.